On a recent April afternoon, MIT sophomore Francis Wang drove out of the Edgerton Center’s Area 51 garage, took a left on Massachusetts Avenue, a right onto Albany Street, and then a left through the wide doors into Johnson Rink. Her ride: Flux, the 14th solar car built by hand, thanks to CNC machines and late nights in the student shop. 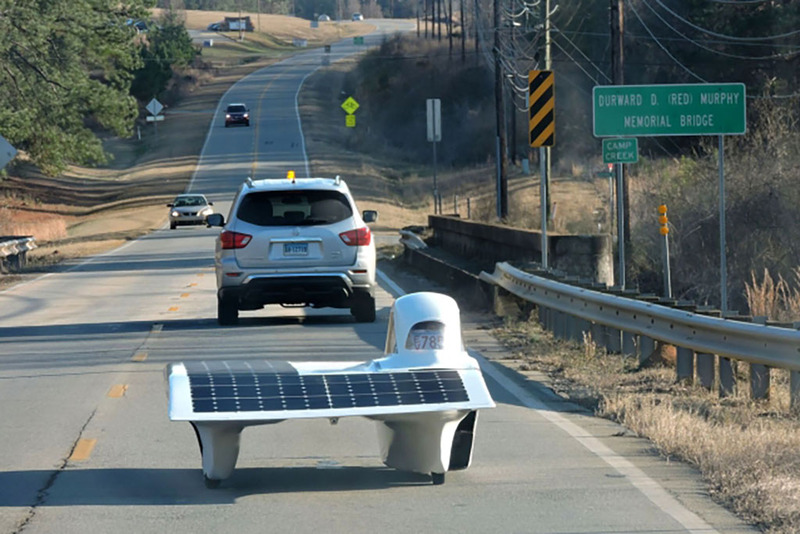 In January, Flux and the MIT Solar Electric Vehicle Team went on a road-testing trip in Georgia. Photo courtesy of the MIT Solar Electric Vehicle Team. The April 26 unveiling marked the official debut of Flux, an asymmetrical solar car that will race in the American Solar Challenge (ASC) in July. For the team of 25 students on the MIT Solar Electric Vehicle Team (SEVT), the unveiling was as much a celebration of how far they’ve come and a send-off for how far they want to go. Seventeen hundred miles, to be exact, from Omaha, Nebraska to Bend, Oregon. Professor J. Kim Vandiver, the Forbes Director of the Edgerton Center and dean for undergraduate research, spoke at the event, and referred to one of the first solar cars, Solectria 4, built by James Worden ’89 in 1988. In fact, five years before the Edgerton Center was founded, Harold “Doc” Edgerton gave the team space in Building 20. According to Worden, “unveilings” for solar cars were a little more off-the-cuff back then. Held at Worden’s house in Arlington, Massachusetts, the team performed midnight test runs on Massachusetts Avenue from one end of Arlington to the other on a stretch of flat and straight, car-free road. This unveiling was more sedate. Junior Veronica LaBelle, team captain, remarked on the power behind a large group of students engaged in intensive collaboration, and her gratitude for the team's commitment. Membership, she noted, has doubled in the past two years. She also mentioned a road block in the summer of 2017. The team’s $10,000 entry fee for the Australian World Solar Challenge (WSC) had been paid, and Flux was ready to be shipped to Darwin, Australia for the race. But more road testing was needed, and the timeline was too tight to ensure that Flux was in competition shape. After hours of agonizing discussion, the team decided to forfeit their entry fee and use their time to prepare Flux for the ASC. Flux stands apart from previous iterations of the solar car with its asymmetrical body. The driver sits on the same right-hand side as the wheel base, which means there’s less drag as it’s racing down the road. The car’s body is made from honeycomb wrapped in carbon fiber. The 5-kilowatt battery primarily stores energy converted from the solar array – 260 silicon solar cells on the canopy of the car. While cruising, the solar array powers the car without much help from the battery. Acceleration, however, requires more than solar power, and some battery power is required to meet the motor’s demand. During the ASC, the team will have a charging period and can start each day with a full battery. Morgan joined the team in his first-year. “When I got to MIT I knew I was interested in mechanical engineering, and I was thinking of a way I could apply mechanical engineering to solving world problems, and I thought energy was a world problem and solar car was the perfect marriage of the two,” Morgan added. The unveiling event gave the MIT community a chance to get up close and personal with Flux, and to learn first-hand what goes into designing, building, and racing a solar car. Some even took their Flux selfies. After Flux had been sufficiently anointed with good solar car luck at the unveiling, Wang put her helmet on, got back in the car, and drove down Massachusetts Avenue to the Area 51 garage. The team has a little more work ahead, including crush zone changes (bodywork that allows the car to absorb the impact of a crash) and new turning fairing. Plus some more hours of road training for the driver. And then, full sun-powered speed ahead, the ASC from Nebraska to Oregon.